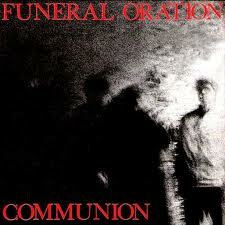 I was digging through some old boxes last year when I came up on my copy of Funeral Oration’s Communion LP from 1985. I got it from Dig Pearson in the days when he did a record distro before he started Earache. Dig was a funny guy. I know a lot of people came to really dislike him, but he was always nice to me. He generally wore nice, button down shirts and jeans with the knees only slightly ripped out. This kind of stood out in those days when the style of filthiness that would later mutate into crust was just being born. Dig’s one sort of concession to the punk aesthetic was a little hand drawn DRI mosher logo on his jeans, with the caption “Mosh Hard Or Be Moshed.” Everyone thought this was kind of funny, since Dig was not the kind of guy who you saw in the pit very often. Anyway, I can still remember getting this disc from him and hurrying home to check it out. This was the first Dutch punk band that I had ever heard. The opening bars of “For the Better” made the hair rise on the back of my neck. They still do. I’ve mounted that track here, since this record is pretty much completely unavailable and for some reason they didn’t include it on the (rather selective) discography CD that they put out a few years ago. Peter Zirschky, whose voice gave Funeral Oration their distinctive signature, apparently died a few years ago. Tragic. This entry was posted on May 24, 2012 at 2:38 am and is filed under Dispatches. You can follow any responses to this entry through the RSS 2.0 feed. You can leave a response, or trackback from your own site.